The club is easy to find. 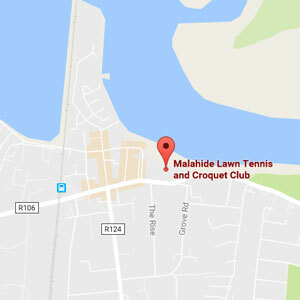 If you enter Malahide village from the city direction, we are located just 100 metres beyond the main crossroads (which is known as ‘The Diamond’). As you approach the club, you will see The Grand Hotel directly in front of you. Club is on the left. Malahide Dart/Train Station is approximately 200 metres from the club. Make sure to get a Dart to Malahide and NOT Howth! Parking within the club grounds is restricted to current Committee members & staff only. Metered street parking is available outside the club (Pay & Display system).